Material peer production (‘fabbing’ and ‘making’) is made possible to more and more citizens by the proliferation of shared makerspaces. Fab Labs have their own distinct network and identity, but they are often grouped together with makerspaces and hackerspaces in studies that examine making, whether conceptual or commercial. However, Fab Labs have the opportunity to share information, resources and projects globally within the Fab Lab network, which differentiates them from independent makerspaces. We focus on Fab Labs in this paper as we relate the story of one seminal Lab that was instrumental in the history of the Fab Lab network and remains an integral part of the network’s mythology, MIT-Fablab Norway. Fab Labs were established by Neil Gershenfeld and MIT’s  Center for Bits and Atoms to “empower”: to lead people around the world “to become technological protagonists rather than just spectators” (Gershenfeld 2005). As a network it is now rapidly growing and attracting increasing interest, from policymakers, educators and technology developers alike. The literature on Fab Labs, while relatively scant, tends to be informal: ‘grey literature’ reports and journalistic articles, on, for example, their role in education (e.g. Tiala 2011). In the English language, the number of surveys, overviews and analyses (e.g. Eychenne 2012, Bosqué and Ricard 2014, Menichinelli forthcoming) and academic studies is growing, with perspectives ranging from innovation (e.g. Troxler and Wolf 2010), to cultural and media studies (e.g. Walter-Herrmann and Büching 2013), to Human-Computer Interaction (e.g. Blikstein and Krannich 2013). The HCI field devotes increasing attention to digital fabrication, unsurprisingly, studying, for example, DIY online communities (e.g. Kuznetsov and Paulos 2010) and the activity of making (e.g. Tanenbaum et al. 2013) but seemingly less so the actual situated spaces, not to mention Fab Labs specifically. Seravalli (2012), for one, examines the social shaping of an independent makerspace. Regarding individual Labs, Fablab Amsterdam has been the target of a user survey (Maldini 2013) and an ethnographic study (Ghalim 2013). Despite being one of the first Fab Labs to be established, little has been written about MIT-Fablab Norway, with the exception of Gjengedal (2006). In spite of this emerging body of work, there remains a certain mystique that surrounds Fab Labs, their objectives and activities. Our aim in this paper is to disperse some of this mystique by allowing a Lab founder tell his own story. This in turn sheds light on how the Fab Lab network both shapes and is shaped by individual Labs (and their key players), and how maker ideologies and mythologies are formed, merge and diverge. Sections 3 to 6 thus set out the elements of our primary contribution: we illustrate how a Lab (and its founder) builds its own identity according to its perceived role and influence in the Fab Lab network; how it positions itself in its own local community and what that means for its identity as a makerspace; and how its identity as a non-conventional ‘third’ place is both threatened by traditional institutions and strengthened by its differentiation from them as it seeks to sustain itself. In all these elements storytelling is the pathway and metaphors the vehicle by which we come to know and understand them: how culture is transmitted and practices and values are promoted by a charismatic storyteller. We summarise our analyses and interpretations in section 7 and spell out the implications, not only for current insight and future research potential, but for the future of Fab Labs themselves. The following section will review the methods for conducting the fieldwork and compiling this narrative. Our own story as researchers began independently, as we visited the Norwegian Lab separately, pursuing our own doctoral research and conducting our own fieldwork. In both cases Lab founder Haakon Karlsen Jr., a well-known personality in the network, hosted us and spoke extensively with us. We wrote about our experiences informally in weblogs, which we shared in our social media circles. Bosqué’s account (in French) (Bosqué 2013) was similar to Kohtala’s experience (Kohtala 2012a; 2012b) in a sufficiently compelling way that Kohtala translated Bosqué’s text in another blog entry (Kohtala 2013); this led to an invitation by this Special Issue’s editors to compile our accounts in a joint paper. Our starting points were similar, as we both have design backgrounds and have been conducting ethnographic research in makerspaces. We both employed semi-structured interviews and recorded conversations and observations in fieldnotes. The interviews allowed the subject to dictate what he felt was important while certain topics were anchored according to our respective research interests – as true to ethnographic research tradition (e.g. Van Maanen 1988). The interview topics were hence not derived from literature or any theoretical background as an attempt to confirm theory. 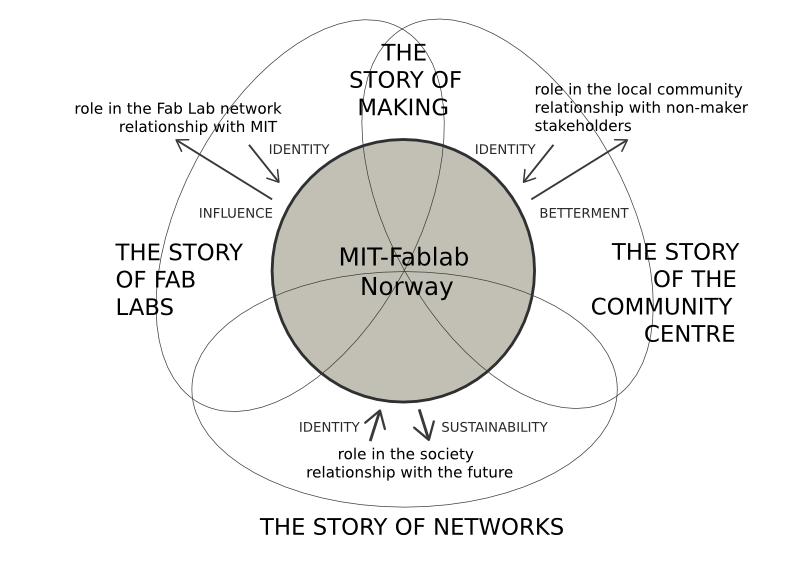 In Norway the Lab’s profile regarding typical activities, users, relationships in the local community and ties with the global network were important to both of us, while Kohtala probed especially environmental sustainability issues and Bosqué investigated the very roots of MIT-Fablab Norway and thus the origins of the network itself. Kohtala’s data set consisted of nine audio and three video recordings, 200 photographs and fieldnotes. The videos and photographs were not analysed but served to supplement the fieldnotes; qualitative data analysis was conducted on the fieldnotes and audio transcriptions (according to Strauss and Corbin 1998). Bosqué’s data consisted of eight hours of interview (in five audio recordings), 400 photographs, fieldnotes and numerous drawings made during conversations as a key research tool (Taussig 2011). What was at first problematic from the perspective of ethnographic research (but something that emerged as a key finding) is that there was surprisingly little activity ongoing in the Lab during our visits that we could observe. Visitors came in and out and there was much coffee consumed, but it was not the type of traffic nor amount of fabricating activity we were accustomed to from other Fab Labs. During Kohtala’s visit (four days in September-October 2012) there were regular visitors but only one person came in and used the equipment (for prototyping). During Bosqué’s visit (ten days in June 2013) the fabrication tools were not used at all. This seeming inactivity found its explanation as we document below, but for data gathering these circumstances affected us differently. • sustainability (as a central concern of her doctoral research). For Bosqué, the mutual impact of ethnologist on study site in the process of developing an emic, insider view was an important methodological issue. The rather odd experience of immersion of a maker-researcher in a nearly empty Fab Lab site thereby became an important theme (following Favret-Saada 1990). Her other main topics included the history and pre-history of the Lab; the projects undertaken and promoted; and the description of the site and its current status. We expanded upon these themes in writing independently and proceeded to interweave the texts, a conversation that involved ranking not only what was most salient (e.g. prevalent in the data) but what we regarded as most important for future theory building and further research. This resulted in three main themes; we illustrate how they are presented in the structure of this paper in terms of ‘stories’ in Figure 1. Figure 1: The themes of this narrative and how they are presented: the three themes (role in the Fab Lab network, role in the local community and role in society) are described via four stories, respectively the story of Fab Labs, the story of the community centre and the story of networks. The fourth story, the story of making, bridges the network and local community themes and each story is presented in a separate section, as follows. Surprising little has been written about the germination of the first Fab Labs aside from Gershenfeld’s own account (2005). Both Bosqué and Kohtala listed this history as a theme and Bosqué especially pursued this line of inquiry (see Bosqué forthcoming). What became salient were not only the local details previously unpublished, which were themselves absorbing, but the multiple voices presenting alternative versions of the birth. This is obviously not unusual in itself, but it served to illustrate that how main characters choose to tell and share these stories, and with whom, reveals much about how they see their local conditions, what they esteem, and how they view their own rights to shared commons. Considering the history in this way is a tangible and logical starting point, as makerspaces often consider the decision to become an official Fab Lab or not upon inception. Each Lab will thereafter have its own relationship with MIT as well as with the rest of the network and can choose how this relationship is embedded in its identity and, in reverse, how it wants to affect the development of the network. (See Figure 1.) In turn, the MIT mothership can use individual Labs’ stories and projects in the evolution of its own mythology, oft repeated in the popular press. Enthusiasts of maker culture often meet Haakon Karlsen Jr. first (or solely) in Neil Gershenfeld’s book Fab, where Gershenfeld uses the expression “growing inventors” to present “community leaders around the world, who are embracing emerging technology to help with the growth of not only the food and the business in their communities but also the people” (Gershenfeld 2005, 77). From personal fabrication to grassroots community development, “technological protagonists” such as Mel King in Boston, Nana Kyei in Ghana and Kalbag in India are described throughout the book as local inventors, raising opportunities through technologies for the people around them. In the book’s ‘Network’ chapter, Gershenfeld presents several examples of “innovators in telecommunications infrastructure” (Gershenfeld 2005, 181). Karlsen is one of them; two pages elaborate on how, despite the fact this farmer and herder in the Lyngen Alps is “less interested in hearing from satellites in space than from his animals in the mountains”, one day he comes up with the idea of tracking his sheep with the help of radio signals (Gershenfeld 2005, 187). Karlsen is presented as a down-to-earth person with relatively prosaic interests: to simply find his animals in the mountains at the end of the summer and protect them from danger. With the help of Telenor’s Tromsø office, Norway’s national telecom operator, Karlsen developed a kind of GPS receiver that was quickly able to report locations. Bosqué took one sentence from Fab and asked Karlsen to give more details: “Telenor initially put these together, then in 2003 a Fab Lab opened on Haakon’s farm to continue development and production of the radios and antennas there” (Gershenfeld 2005, 189). This prompt brought forth the story of the Electronic Shepherd, in which everything started a little before the year 2000. According to Karlsen, at that time livestock populations were suffering due to rampant disease; in 1994 the Norwegian government established a laboratory for artificial insemination of sheep and goats. In the Lyngen region, however, Karlsen in collaboration with several farmers and shepherds were seeing surprising success rates of up to 94% instead of the usual 10%. Karlsen quickly realised this was due to two farmers he was working with, who knew their animals so well they knew how to inseminate at the exact moment of ovulation. “To succeed, it was necessary to know when the females were in heat. I suggested that we imagine for ourselves a technical tool to measure hormones,” Karlsen recounted. Eventually they developed a small temperature-sensing device that sent a message to warn the farmer that ovulation was impending, based on the female’s brain activity. Later they thought about possible use for the device for the rest of the year: “We put an accelerometer in our little machine to capture the movements of the sheep. To test this feature, we created a system that calls home after fifteen minutes of inactivity for the sheep, saying, ‘I’m dead’. We then put in a GPS, which allowed us to get the geographical coordinates of the sheep sent to the farmers.” The original “sheep phone” – later called Electronic Shepherd – was born, in a “strange” laboratory on a farm on top of the world. In order to improve the GPS reception from the fells to the farms, Karlsen and his colleagues worked with Telenor for one year. There was an innovation competition launched by MIT globally to develop local projects. MIT sent some of its best teachers to Norway to find a suitable cooperation project. They found us through Telenor, who told them: ‘There is this crazy guy lost in the fjord who devised sensors for his animals.’ We enjoyed a great year of cooperation with MIT in 2001 and we were invited to Boston to present and develop this project. It was fantastic, but after years of collaboration we had to terminate the project. We had a discussion at MIT in Boston and we decided to do something to further enable this kind of adventure, something we would call… a Fab Lab. A Fabrication Laboratory. The decision was taken on 18 October 2002, I remember. We first decided to launch three Fab Labs. One in Pune with a man named Kalbag, from Vigyan Ashram, south of Mumbai, and another in a poor neighbourhood of Boston called South End Technology Center, with Mel King. And the third here in Norway. In conversations with Kohtala, these three labs also formed the constellation of the first Labs in repeated tellings. At one point, Karlsen hesitated for a moment, remembering: “No, Ghana also came. And Costa Rica also has some story….” To be sure, this is confirmed in NSF’s press release: “The first international fab lab was established in Cartago, Costa Rica, in July 2002 at the Costa Rica Institute of Technology. […] This was followed in June 2003 by a fab lab far above the Arctic Circle in Solvik Gård near Tromsø, Norway” (NSF 2004). In my memory there was Gershenfeld, Kalbag, Mel King and me. Mel King is an old fellow who was a professor at MIT and Kalbag was an old Indian who had many projects in the community. He came into contact with MIT through links with the Indian government. A bit like here, he had created a local system for watering different plantations and was spotted by MIT. In the ‘official’ version, MIT-Fablab Norway is one (excellent) example among many others; in Karlsen’s version, the team consists of the “growing inventors” that Gershenfeld presents in Fab, and he ensconces himself comfortably at the same table, at the centre of the story. Bosqué later interviewed Sherry Lassiter, Director of the Fab Foundation, a body that supports development of the network, who had another version: “How did it start in Norway? Well, I think at one point, after seeing what we did in Ghana and Costa Rica, Haakon must have come to us to ask if we could do the same at his place….” As is common in these kinds of endeavours, people remember, reason and portray the origin stories differently; what are highly relevant details for one are for others natural to present in a more sweeping manner. Our intention is not to establish for posterity whether MIT-Fablab Norway was number two or three or five in the world, but rather to emphasise the importance the MIT connection may carry for some Labs: in this case core to the Norwegian Lab’s identity while peripheral to others’. Bosqué for example also later interviewed Mel King, who expressed little interest in the Fab Lab movement, having visited only the Norway Lab in the early years (“There is a little bridge named after me there”) – while remaining active in and committed to the Boston Lab. For Karlsen, in contrast, the close connection to MIT – and close friendship with Gershenfeld – both based on the Electronic Shepherd project, earned him and his projects a new identity as well as especial influence in the emerging network, particularly in the early years. In the following section we discuss this influence in the form of another Karlsen story: the definition of a Fab Lab. A salient feature to Kohtala during her research visit was Karlsen’s use of repetition in his storytelling, to punctuate and persuade, and the most common repeated phrase (all of which are italicised in this section) was his definition of a Fab Lab: a global network of people who want to cooperate and share knowledge. Fab Labs must also be free and open: one must not close the door to anyone nor have a “taxi metre” at the door. Fab Labs may charge for their services if needed, but they should do so “in a room beside”. We should concentrate on what people really need, not on useless things. People need to solve their own problems, there where they live. This last phrase is also stressed by Gershenfeld, in Fab, news articles and documentaries. Karlsen showed Kohtala a CNN-produced video on Gershenfeld and the Fab Lab concept, focusing especially on the Norway Lab. Gershenfeld speaks: “What we find is that people don’t just need information on a screen, they need it out in the world where they live … for health care, for jobs, for education…” (CNN 2008; emphasis added). He reaffirms Karlsen’s underscoring of the local and situated, or perhaps vice versa. In fact Karlsen’s and Gershenfeld’s discourses diverge and converge like a DNA strand: they converge on concepts such as ‘community’, i.e. community empowerment and betterment, meeting needs, and where they live, but Karlsen plays down the role of the equipment. “The absolute most important success criteria for a Fab Lab [is] the people.” 3D printers are especially useless – except when learning how to make them. In contrast, Gershenfeld defines Fab Labs as “high tech, low cost workshops, equipped with the tools to make almost everything…” (CNN 2008). It is possible that Karlsen, given the growing media interest in all things related to personal fabrication, feels increasing pressure (or responsibility) to put the people, not the technologies, at the centre of the story. We will even see this prioritisation physically, in the layout of the Norwegian Lab space, in section 4. This is not a conflict but rather a sliding scale of choice: an opportunity for ongoing debate, not only for the Fab Lab network but for the entire maker movement. What Karlsen values in a Fab Lab and the relationship between the social and technological remain central points of discussion in maker discourse today (e.g. Bauwens et al. 2012). Principles of open access and sharing knowledge were explicitly embedded in the Fab Charter, a document that Fab Labs are strongly encouraged to display and one in whose development Karlsen played a role. As for what is done in Fab Labs and makerspaces, and why, this is an ongoing ethical debate in the network, as well as maker culture, in which Karlsen surely carries less sway despite his best efforts. We will later return to Karlsen’s definition of a Fab Lab, as it becomes central to the question of the network’s future as well as how we regard – or, rather, how Karlsen describes – our transition to a network society. Alongside MIT-Fablab Norway’s identity as a seminal MIT Fab Lab, the site’s peripheral location is core to its identity. The Lab is reached by a small laneway leading off a pleasant road that winds its way south of the town of Lyngseidet through a landscape of fells and farms, far up north on the 69th parallel. It is a large, traditional Lapp log building that looks like a community centre or a rural dance hall. It is surrounded by smaller buildings for accommodation, where both researchers stayed. Its entrance is flanked by two flags: that of the region and an American flag. Each year about 600 people pass through the Lab’s doors. Gershenfeld apparently also exclaimed about the number of beds here and there, near workstations, where one can remove shoes and have a quick nap. Next to the kitchen, coffee, various teas, muesli, biscuits – and Aquavit – are available. The many tables (and outside cabins) help accommodate any visitors who want to stay in the area for a few days to go hiking or skiing. The Fab Lab is thus a tourist facility as well as a place for prototyping, a function that guarantees a good part of its funding. Karlsen even said that skiers sometimes become curious and use the Lab. 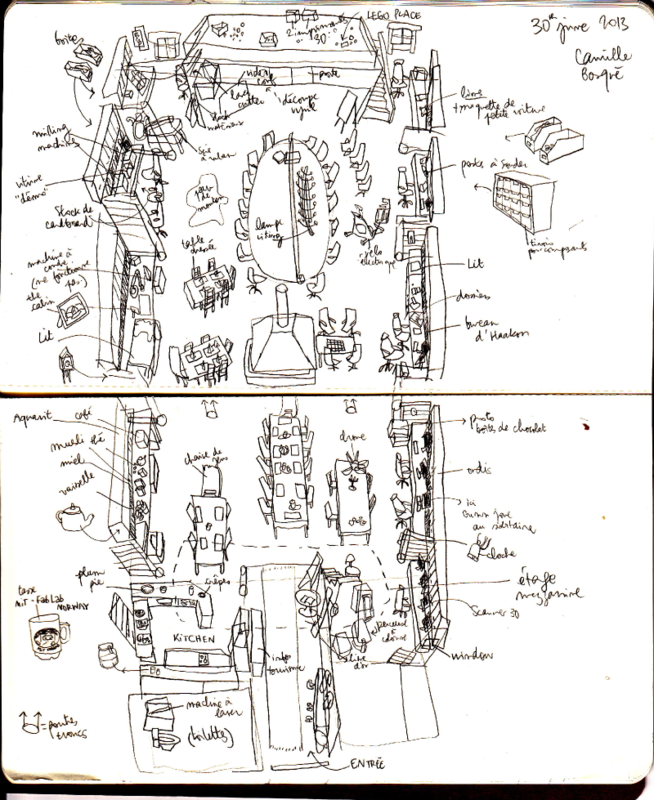 Figure 2: MIT-Fablab Norway, extract from Bosqué’s sketchbook (30 June 2013). Note the placement of hearth, chairs and tables in the centre, while digital fabrication tools and equipment are centrifuged to the back and sides. There is a kitchen immediately to the left as one enters and a bed or resting place on each side among the workstations. Karlsen is in his early sixties. He was born here and, after training as an engineer, spent his youth working with sheep insemination on the family farm, which is located “just down from the Fab Lab”. He’s an unmissable figure in the region; he has also been successively a teacher and farmer. He owns several houses and land at the edge of the fjord. Karlsen himself described his Fab Lab as now more of a “community centre” than a place for prototyping: “It has even held a wedding celebration!” His stories to both researchers about visitors, activities and projects confirmed this representation. For instance, the video-conferencing screen broadcast other Fab Labs’ webcams during our visits, but it is especially useful for other purposes: Karlsen reported how professionals such as nurses come here to attend distance education courses conducted in Oslo or Trondheim. The mayor of the municipality came by during Kohtala’s visit; Karlsen said he drops in from time to time to discuss local problems, such as the number of school drop-outs in the region. Others popped in for coffee during Bosqué’s visit to find out about the impending birth of the most recent foal. Such unconventional activities for a Fab Lab also meant unconventional roles for researchers. We helped cook, we went for walks in the stunning terrain, and we worked long hours – either talking with Karlsen and his visitors or working alone on our notes, bathed in the strange pine-yellow light. The equipment was usually silent. When we dined, we sat on dramatic high-backed wooden chairs, each named and physically profiled after a local fell. Designer Jens Dyvik (see DyvikDesign 2013) had helped realise the chairs on the ShopBot, a milling machine that was conspicuous by its absence. Bosqué began to ask about it often enough that finally – despite his reticence to have any focus at all on the technologies – Karlsen agreed to take her to the farm where the milling machine was housed. It was hidden behind a door in a small shed at the end of a cluttered barn; it was dusty and likely not recently or regularly used. Moreover access was difficult and the room narrow. During winter, when sheep come back from the fells, they are herded in with the ShopBot. Perhaps because MIT-Fablab Norway was quite unlike any other fieldwork site we had visited, we became hyper-aware of how Fab Labs are ‘third places’ other than work or home. We saw afresh how the Fab Lab network – as a community as well as a collection of communities – differs from how we understand and relate to institutionalised societal structures such as formal education or industrial mass production. This can paint Labs as unfamiliar and mysterious places for the average citizen. However, it was ‘normal’ for anyone to walk into the Norway Fab Lab, from the mayor to farmers to the neighbour renovating his house; this almost domestication of fabbing (especially considering the kitchen and the beds in the Lab) began to render the outside world and its conventional structures as almost unnatural in their turn. This was compounded by our own experiences of immersion and suspension in the Lab’s environment, as well as Karlsen’s own discourse – which heaped scorn on traditional institutions (especially universities during Kohtala’s visit) while praising openness and reciprocity. Such a normalising process was obviously enabled by Karlsen’s charisma and role in his community; we have no doubt he would have had an equally influential role in Lyngen had the MIT connection and Fab Lab germination not occurred. As it did, Karlsen was the conduit to make the otherwise opaque construct of a Fab Lab acceptable and everyday in its small, rural local community. To be fair, considering the population of the region, perhaps the amount of personal fabrication that took place during our visits was proportional, and there was certainly evidence in abundance. In the following section we return to the core of a Fab Lab, the making, a subject that bridges the identities of the Norwegian Fab Lab as both a pioneering MIT Lab and as a third place for community work of various kinds. What should be noted about the Lab’s making activity is its place in the timeline: the most significant hustle and bustle seems to have passed, as the Lab continues in a trajectory into more consequential municipal community involvement, likely driven by funding opportunities as well as Karlsen’s commitment to local action and betterment. However, even as Karlsen relied on storytelling means to communicate the tale of the community centre, an obvious source of pride and achievement, he was especially animated when relating stories about making and inventing. In his anecdotes Karlsen was especially skilled at building up tension: at ‘gearing up’ his listener for an exciting outcome. “What is this?” he asked Kohtala, as they sat at the table on a chilly September evening, hints of the Northern Lights glimmering outside. The stories always started this way, the presentation of the problem or context, the heroes, the first ideas and prototypes, the struggles… and eventually the result, whether it was the artificial insemination device, developed as part of the Electronic Shepherd process, or a solar-powered LED lamp developed in Africa. The effect was not to emphasise the object or the invention however; the intention was always to stress the need the invention caters to – which was always local, always developed in collaboration, and always something that combined previous, even ancient, ideas in new ways. “What is this? It’s a house for a dog race.” The next object was placed on the table, as simply sheets of lasercut cardboard. The organisers of a large dog race had come to Karlsen and explained their problem: they had hundreds of dogs racing over an entire fortnight and sleeping in hay outside. A proper shelter system was needed so each dog could have security and rest. “I said we can do it flat-packed,” explained Karlsen, “and we made the first prototypes.” In story after story links were constantly drawn between people and ideas, during planning and fabrication. When Bosqué asked Karlsen why he likes these stories, he answered: “You must not have the feeling that I have made that alone; all this is the result of a global network of people who want to cooperate and share knowledge: two kids from Boston, a shy woman from northern Norway….” Who had the idea, who did the design, who contributed – sometimes these were remembered and important and sometimes not. What was central was that the outcome and the process in which it was developed manifested the spirit of a Fab Lab: free and open, for people’s own needs, where they live. Moreover, knowledge should be shared and people should not be categorised when they come in the door: “inventor” became synonymous with “designer” and “maker”. In Nordic languages, the word ‘design’ is cognate with the term ‘form-giving’ and many other words equally serve, such as ‘planning’ or ‘developing’. Karlsen tended to favour these other verbs, and during a pause Kohtala asked him directly for his definition of design. He hesitated and laughed at the same time: “No.…” “Because these [objects you are showing me] are designed,” she countered. “So all the boats, all things people have needed over millions of years, have been developed by people where they are, […] for their use, scaled for the way they really need it,” he replied. The real answer to Kohtala’s question came at the end of the day, at the end of a different, unrelated story: “Back to your answer, what is design, and who has the decision on what is design, nobody,” he stated emphatically. One cannot help but be reminded that Lyngseidet is a small, remote municipality where urban tendencies to specialisation are impossible or even detrimental. Making and fabbing in this context serve as local entrepreneur support and citizen education, for purposes ranging from marketing and product development to agriculture or telecommunications research to simply exploring and learning. The making and prototyping was furthermore where the links to the global network became more visible: during Kohtala’s visit Knut Klo was working on the design of a drone, a ‘helicopter’ that could carry a camera, whose plans were to be made available to the Fab Lab community on the Wiki. The drone had first been developed by Klo, Karlsen and Dyvik, who by that point was in Indonesia working on the inter-lab “low-cost prosthesis project” with Fablab Amsterdam’s Alex Schaub (lowcostprosthesis.org 2012). In the early hectic years, the Norway Fab Lab was a making hub, hosting several well-attended Boot Camps as well as FAB2.5 and forming important, lasting connections. In one video (fablabbcn 2009) posted on YouTube, Gershenfeld can be seen perched on the mezzanine, working with his computer on his stomach. Schaub is also there, as is Tomas Diez from Fab Lab Barcelona. Karlsen spoke less about these Boot Camps, however; his stories tended to regale the early projects that marked the genesis of a particular Lab, whether it was the “sheep phone” that inaugurated his own Lab or the LED lamp (which became known as the “Haakon lamp”) associated with the genesis of one of the Kenyan Labs, which Karlsen helped found. Similarly, Karlsen’s making stories about solutions for the region’s entrepreneurs emphasised local needs and the connection to and collaboration with the local community. In all probability stories strictly about fabbing activities amongst maker insiders had less appeal except when they had a social dimension. To be sure, what excited Karlsen most was diversity: when anyone can design, develop, invent, make and build, and when diverse people come together without the barriers of conventional institutions, then something truly powerful can happen. In Karlsen’s world, such an empowering vision is rendered conceivable and attainable by the three processes we have observed thus far: the third place characteristic of Fab Labs, which helps break down traditional conceptions of access and jurisdiction; the normalising effect of the Norway Lab and how it embraces a wider set of collaborators not restricted to maker practitioners; and the promotion of the vision through rhetoric which aims to inculcate attitudes and values. We learn through his storytelling that entering the Fab Lab world promises skills and knowledge, a way to meet one’s own needs and other espoused benefits; we may thus consider not just desirable but inevitable the transition to a network-based society – or the non-hierarchical, non-judgmental society Karlsen wishes to promote. For example, for all his criticisms of universities – in Kohtala’s paraphrasing this meant their hierarchies and the power granted to professors, their ability to dominate innovation support systems as well as knowledge transmission, and their tyranny over science – Karlsen would provide numerous inspiring stories about individuals reaching their own potential: where people of all ages and abilities were granted access to knowledge sharing and teaching at the Fab Lab. Moreover, where the “magic” happened was not merely through open access for the marginalised but when different types of people were able to mix together: “During many years we have had so many strange people here in the Lab; […] when you find many different people, where they have this cross-over, then you have something. How can you put all this down in rules: it’s impossible.” For Karlsen, “strange” was a neutral adjective used to describe nearly everything, from the unconventional or surprising to the unknown. These strange people are not allowed into universities because of “rules” – which also bar them from jobs, entrepreneurial support or simply opportunities to explore their own ideas and inventions. This does not mean a network-oriented, heterarchical social world does not have rules: the Fab Lab network has the Fab Charter that embodies the values of openness, access and reciprocity. There are no sanctions for not following the Charter, if one does not include having to endure Karlsen’s heated chastisements. Instead, in true p2p fashion, the conformity ranking is made transparent: an ongoing chart that documents each Lab’s compliance with the Charter principles – open access for the public, having a basic inventory of the same equipment that eases inter-lab project work, and giving something back to the network (NMÍ Kvikan 2012). …there are so many people who see that the Fab Lab network is super cool, and they try to make a description, to put the Fab Lab into a form, into a matrix, and it never fits. The Fab Lab here is one thing, the Fab Lab in Africa is another, the Fab Lab in the United States is a third one. There is no sense to make all the labs exactly the same. The diversity, that’s the good thing with the Fab Lab. However, if indeed the Fab Lab world does become normalised (and note that we use both normalisation and domestication as descriptive, exploratory terms and not as definitive interpretations at this point), what may happen to its self-conception as an alternative: as not institutionalised or at least consciously avoiding the hierarchic structures of mainstream institutions and their concomitant rules and categories? Perhaps there are some clues in how Karlsen understands and conveys the very idea of the Fab Lab network. Normally an organisation should be like this: you have the Fab Foundation at the top, you have Fab Labs, you have business creation here in the middle, and you have the Academy here on the side. This is the normal way to organise a structure. […] This is how you would learn it in […] business school. Then you report, and everything works well. But here, in the Fab Lab structure, all the arrows are upside down. […] The top is only a result of what is happening in the grassroots. It’s not some people who sit at the top and give orders and make the structure down through the organisation, down to the Labs growing up all around the world. Here you seed something and coming up is a strange thing, and you have […] the grassroots stream up all the time, so all the arrows in a Fab Lab organisation are upside down. Or downside up. How Karlsen describes the process of “seeding” here is particularly apt: one may plant a seed, but what comes up will take on its own character based on the soil, the sun and the nutrients available. The best way to develop, or grow, solutions for a particular community is to enable it to meet its own local needs, where people live. A Fab Lab is a seed, or a container for one. And what then is the role of the Fab Lab network? For Karlsen, the network is a global coming together of “many small brains” that become a “big brain” when they cooperate and work together according to the same values or “with the same approach”. When describing the ‘helicopter’ project, Karlsen suddenly veered to talking about the material chosen for the propellers and how their milled birch propellers do not break. Superior to the carbon fibre common in such projects, birch is described as “fantastic”, a “living material” that has “computers in every cell”. This way of portraying wood – and plants by implication – as a distribution of intelligence is so akin to how he describes the Fab Lab network, i.e. as a “network of brains”, that one sits up and takes notice. This is why Karlsen wants us to focus on the people and not on the technologies: it is the people and their individual strengths and curiosities that have formed the Fab Lab movement and will continue its trajectory. Again we hear the definition of a Fab Lab: “A house like this, that’s only a facility and all the things you have around here, the tools, software, a Fab Lab you have to remember absolutely all the time, a Fab Lab is a global network of people. It’s not a global network of houses or other dead things, it’s a global network of people that want to cooperate and share knowledge.” Not only the material is living; the knowledge is living knowledge and the network is alive and organic, growing, evolving and changing. Technologies in themselves do not better communities; the “remarkable story” is contained within the “combination of brains who push all of us a little bit forward”. Karlsen asks us to consider “how did all these brains stimulate each other to make remarkable things, and you [will] see that nothing is impossible”. Through Karlsen’s storytelling, people become the heroes of a collective adventure, where doing one’s best and doing it for everyone’s betterment is paramount. Nevertheless, there is an obvious concern for an organisation that wants to remain free and open. Near the end of the visit, Kohtala asked about a Boot Camp schedule where a discussion topic was titled “Business, Entrepreneurship and Sustainability”. Despite common rhetoric in maker culture as to the environmental benefits of small-scale digital fabrication, Karlsen confirmed that “sustainability” in that case was financial, not environmental, as funding for Fab Labs becomes increasingly problematic as they develop beyond the first few years. Economic sustainability must now be the priority for Labs: it is “the most important thing”. How this is playing out in the Norwegian Lab, however, seems to indicate a move away from making and fabbing as central practices and towards other sources of income such as tourism that require completely different skill sets. Moreover, emphasising the Fab Lab as a third space may recruit maker practitioners, but it may also repel other key stakeholders. Karlsen’s stories are peppered with references to how Fab Labs fall into the gaps – neither concerned with education, innovation, agriculture, industry, technology development nor social development – but all of these and none of them simultaneously. In a world of old paradigm conventional structures, funders may find it difficult to grasp what exactly it is they are being asked to finance. The very identity of a Fab Lab as representing a new paradigm, as expressed in Karlsen’s discourse, is both the source of its frailty and its strength. For reasons of space, clarity and coherence, we have summarised our fieldwork into three themes and four stories, keeping in mind the perils of omission that come with such neat packaging. We have attempted to limit these dangers by constricting the size of our themes and restricting our analysis to focus on Karlsen’s storytelling. This allows us to condense the following key messages. Not all Fab Labs in the MIT Fab Lab network are alike, despite their surface similarity; each Lab becomes an entity shaped by – and over time also shaping – its founders, funders, fabbers and followers. Labs are also likely to experience a tension or need for balance between acting in their particular local environment and reaping the benefits of belonging to the network. Labs may value the MIT connection and wish to make it part of their profile and in turn may procure more influence in the network; MIT’s Center for Bits and Atoms by the same token can co-opt positive stories from individual Labs. Because of both its history in the network and its peripheral location, both of which tend to the extreme, the Norway Lab accentuates this Janus-faced character: its Arctic rurality is core to its identity, but so is the identity of MIT and the global, virtual network. We thereby clearly see the role that seminal Fab Labs and individuals may play in communicating (and at times steering) the image, goals, strategies, visions and ambitions of the Fab Lab network – both within the network itself as well as to outsiders. Secondly, we have shown how the Norwegian Fab Lab, in its identity as community centre, differs from other Labs in the network in a way that makes it more acceptable and almost domesticated to its local community. This made for a somewhat strange experience for the maker-researchers but is likely a factor of its peripheral location, which necessitates cooperation across a broad range of interests. Nevertheless, the effect was that of a distancing from prototyping and fabbing. Thirdly, this portrait of a Fab Lab seemingly moving away from digital fabrication activities can indicate what may happen to younger labs as they become more established, swayed as they are by local conditions, charismatic leaders, and the need to remain funded in some form. The last point is especially pertinent, as the need to ensure economic sustainability easily comes into conflict with other values espoused in makerspaces: open access, free sharing, suspicion of mass manufacturing, and the like. This seems to be the fulcrum of success upon which Labs pivot – whether continued existence is ensured by becoming a community centre, a research laboratory, a fabrication service, or another adopted identity that conforms better to rather than rebels against conventional categories. Finally, we have illustrated the role of stories and rhetoric in shaping culture – stories to boost learning, stories to establish reputation, and stories and metaphors on growing and seeding as guides for envisioning new forms of organisation. We have seen how this Fab Lab founder, with seemingly few exceptions, walks the talk and embeds the values he espouses in his Lab, but he may be afforded this opportunity by his other identities in the community (farmer, teacher, inventor, social worker and so on) that surround his profile of Fab Lab Director. We emphasise that these implications emerge from a particular story created by a place, time, a charismatic lead character, and a particular set of circumstances. Capturing a moment of time in an otherwise quickly changing phenomenon can shed light on what came before and – for the researchers that come after us – what develops in future. We find this particularly relevant in the case of Fab Labs, as they serve as a visible, observable representation of what happens when a group of people decide to formalise material peer production in terms of a designated space and provide a certain infrastructure for making. Subsequent explorations may address the literature and reflect upon certain nuances of this story: exploring the data anew with lenses focused even more on how the community provides infrastructure and shares and protects its commons (as in Star and Ruhleder 1996; Ostrom 1990). This narrative aims to provide a foundation for this future work. Bosqué, C. forthcoming. History of FabLabs. Origins, purposes, development and new directions. In: Menichinelli, M. FabLab. Revolution Field Manual. Rome: SHS publishers. CNN 2008. ‘Principal Voices: Neil Gershenfeld’. Favret-Saada J. 1990. ‘Être affecté’, Gradhiva 8: 3-10. Gershenfeld, N. 2005. FAB: The Coming Revolution on Your Desktop – From Personal Computers to Personal Fabrication. New York: Basic Books. Menichinelli, M. forthcoming. FabLab. Revolution Field Manual. Rome: SHS publishers. Ostrom, E. 1990. Governing the Commons: The Evolution of Institutions for Collective Action. Cambridge, MA: Cambridge University Press. Star, S.L., Ruhleder, K. 1996. ‘Steps Toward an Ecology of Infrastructure: Design and Access for Large Information Spaces’. Information Systems Research 7(1): 111–134. Strauss, A., Corbin, J. 1998. Basics of Qualitative Research: Techniques and Procedures for Developing Grounded Theory. Thousand Oaks, CA: Sage Publications. Taussig, M. 2011. I Swear I Saw This: Drawing in Fieldwork Notebooks, Namely My Own. Chicago, IL: University Of Chicago Press. Walter-Herrmann, J., Büching, C. (Eds.) 2013. Fab Lab: Of Machines, Makers and Inventors, Cultural and Media Studies. Bielefeld, Germany: Transcript Verlag.